What's involved in the theory test? 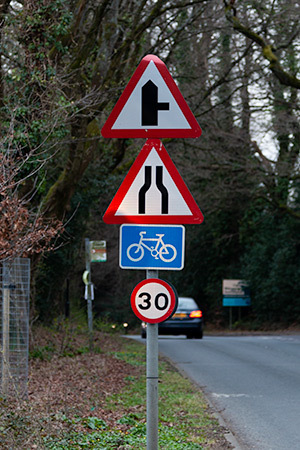 The theory test is a computer-based test, divided into two parts - multiple-choice questions, and the hazard perception test. Both parts are taken in the same sitting. The multiple-choice element consists of 50 questions. Each question has 4 possible answers, and you must select the correct answer or answers. Some questions have more than one correct answer, so take care to read the question carefully. You have 57 minutes for this part of the test, and must answer at least 43 questions correctly to pass. You don't have to use all the available time, and can end the test as soon as you're happy to do so. You are then allowed a break of up to 3 minutes before starting the hazard perception element. Before starting the hazard perception test, you'll be shown a short video explaining how it works. You will then be shown 14 video clips, featuring everyday scenes from the driver's perspective. Each clip features at least one ‘developing hazard’. One of the clips contains two hazards. You must click the mouse as soon as you see a hazard developing. You can score up to 5 points for each hazard - the sooner you spot it, the more points you will score. The pass mark is 44 out of a total of 75 points. Unlike the multiple-choice test, you only get one chance to view each clip, and can't go back and review or change your responses. What preparation should I do? As a student of Chapman's Driving School, you will benefit from free access to Theory Test Pro, an online training programme covering both multiple-choice and hazard perception aspects of the test. This is an ideal way to prepare for your test. Theory Test Pro is also available as a smartphone/tablet app. How do I book my theory test? The theory test currently costs £23, and can be booked on the DVSA website. Alternatively, you can call 0300 200 1122 to book by phone. You can find your nearest test centre on the DVSA website. What can I expect at the test centre? Make sure you arrive at the test centre in plenty of time. You'll need to check in with the desk staff, and you must present your provisional driving licence. If you forget to bring your licence, you won't be allowed to take your test and will lose the booking fee! You aren't allowed to take personal items into the test room. You will be asked to place any such items in a locker before your test. After the test, you should return to the waiting room. Your results will be printed and you'll be called to collect them.